For the Improved and Convenient Customer Support we have listed down the most Frequently Asked Questions. Please click on the question title to view the answer of your desired question. 11. How are the installments calculated? Based upon the mark-up rate and the cash flow of the proposed venture. The client/borrower is provided a complete repayment schedule at the time of disbursement of sanctioned amount. 12. What is the repayment period? Is there any grace? The repayment period usually varies from three to five years; however it would be linked to the cash flows of the project/enterprise. Normally the payments are in the form of monthly installments. Grace period depends on the nature of enterprise. 13. What is the loan application process? 14. How can I obtain the application form? These are available both in Urdu & English at our designated branches. Click Our Network to find the addresses of a branch near you. 15. What documents must be attached with the application form? Additional documents may also be required by SME Bank, depending upon the project/enterprise. 16. What if I need help in filling up the application form? Our Credit Officers would gladly assist you in the process. 17. How long does it take to process a loan application? After the applicant has provided the requested information along with attested documents, the process takes around 30 days. Any delays are usually because of inadequate information provided by the borrower. 18. What kind of projects SME Bank finances? All projects/enterprises that are commercially viable and meet the Bank’s lending criteria. We would like to ensure that financing is used for productive activities. 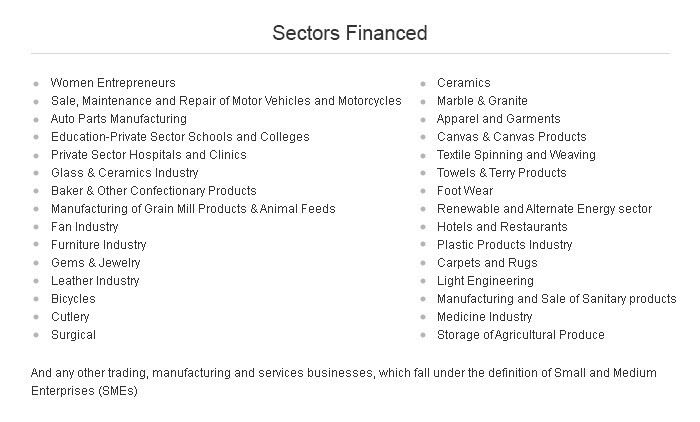 ClickSectors Financed for different sectors financed by SME Bank. 19. How to access Bank’s Facilities? You may call or write an e-mail to a branch near you. Walk-ins are also welcome. Please visit the link Our Network to find the addresses of our offices.